You can’t throw your employees a star-studded night on the red carpet but you can implement a meaningful employee recognition program. Employees will take pride in a token award when it acknowledges they did a good job that impressed their boss and peers. One way to give your recognition program that kind of credibility is to involve employees in creating and administering it. If they design it, they will know exactly what they have to do to earn rewards. They will know what their peers have to do also, so they will respect other winners. They can also ensure that the reward and recognition program provides everyone in the department with an opportunity to earn a reward. 2. Specify Criteria for Selecting Employees For Rewards & Recognition. Oscar winners know exactly what they have to do to win the coveted gold trophy. But in the workplace we sometimes forget to be specific. Too often, awards for things like “innovation,” “showing initiative,” and “quality improvement” don’t define what employees need to do to win. Without that information, some employees will be stymied before they begin. When a winner is announced, employees may attribute a co-worker’s success to favoritism or luck. Or, if you offer an award on an ongoing basis, such as “employee of the month,” they may begin to think everyone’s turn comes up eventually. You could announce a contest, urge everyone to participate, provide plenty of reminders during the contest period, and announce the winner with a flourish. Then what? You’ve got one winner and a lot of losers who discover that their hard work did not pay off. For celebrities, being nominated and attending the awards gala is reward enough. For your team, determine a longer-term impact, define specific criteria, individual goals, and reward everyone who meets them. Publicize each accomplishment and acknowledge each achiever. As long as the criteria are meaningful – the more winners the better! In most organizations, results earn rewards. That’s appropriate, but it lessens the opportunity to use recognition as a way to encourage poor performers to improve. Since they don’t produce many worthwhile results, they seldom get rewarded. By recognizing small behavior shifts, arriving on time, correcting mistakes, helping another person, you can reinforce incremental improvements. This doesn’t mean you should arrange a parade in someone’s honor just because the person finally did what was expected. A sincere thank you or some specific positive feedback is an appropriate response. Give the people what they want. Before you give a workaholic a week off, make sure it won’t feel like exile to that person. On the other hand, before you reward someone with an exciting new project, find out if the recipient will be thrilled or feel burdened. For many of the directors, co-stars, costume designers, production teams, a simple thank you from the stage can make an incredible impact on their career. It is just as useful to acknowledge small successes, as it is to recognize major achievements. It validates the importance of work people do. A simply thank you to employees can start a chain reaction: Pretty soon more people start saying it to more people, boosting morale and improving relationships as well as motivating people to work well. Can you imagine being recognized as the best of the best? When a team, actor, or actress hit the stage to accept an Oscar, they gain more confidence in their skills in the industry. Same goes for your employees. When you give people positive, specific, and realistic feedback about their potential, their efforts, and their accomplishments, their self-esteem goes up. They develop into employees with confidence to set and meet challenging goals, overcome setbacks, and self-manage their work. Intrinsic rewards are the good feelings people get from doing their work; enjoyment of the task, excitement about the opportunities, and pride in doing a good job. You can’t hand someone an intrinsic reward, but you can create an environment that encourages these feelings. Make sure people know their work is worthwhile, treat problems as opportunities for innovation, encourage people to try new ays of doing things, and let them know when they have done a good job. The Oscars are known for handing out individual awards but also recognizing entire teams for their efforts on a project. For team accomplishments, it’s important to reward the whole team, or you foster competition, not cooperation, among team members. Still, there are always some team members who give more effort, and sometimes there are members who coast along on the efforts of others. When the coasters get the same reward as the doers, resentment occurs.Some companies are meeting this challenge with a double-tiered system of team and individual rewards. What ties it together is that for individual rewards, the assessors are fellow team members. You get what you reward. We’ve all seen it. An actor or actress who is rewarded with tons of media attention and film deals after poor behavior or a crazy outburst just validates the actions. Fortunately, the Oscars actually rewards talented individuals and teams based on their performance on the job. As an organization, you must reward employees for the values you’ve published. Because one of the things rewards do is clarify for employees what the organization really wants, they quickly determine that the stated values are meaningful. If you are looking for teamwork, be sure you aren’t rewarding competition. If you want people to resolve problems, don’t reward them for covering up complaints. If you ask for initiative, you may even need to reward people for doing things in ways that make you uncomfortable. The Oscars have perfected the art recognition. From the individual awards to team celebrations and to recognizing those who made an impact, there is quite a bit we can learn. Overall, remember that employees can feel rewarded in many ways, not merely with cash. For top performers, increased responsibility and lessened supervision can be rewards in themselves, as can flexible schedules, additional time off, first pick of desirable assignments, and so on. The point is, the employee must indeed feel that he or she is being rewarded for both working hard and getting results. For more on how to recognize – and reward – your employees, stay up to date on what you should be paying them! 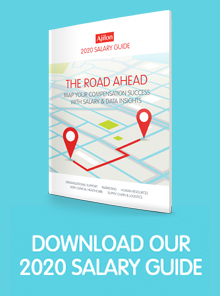 Get our comprehensive 2019 Salary Guide.